Note: This feature is only available to hubs that have advocate to advocate interaction enabled. More on the community toggle below. Advocates now have dedicated profile pages containing their picture, contact information and recent Hub activity. 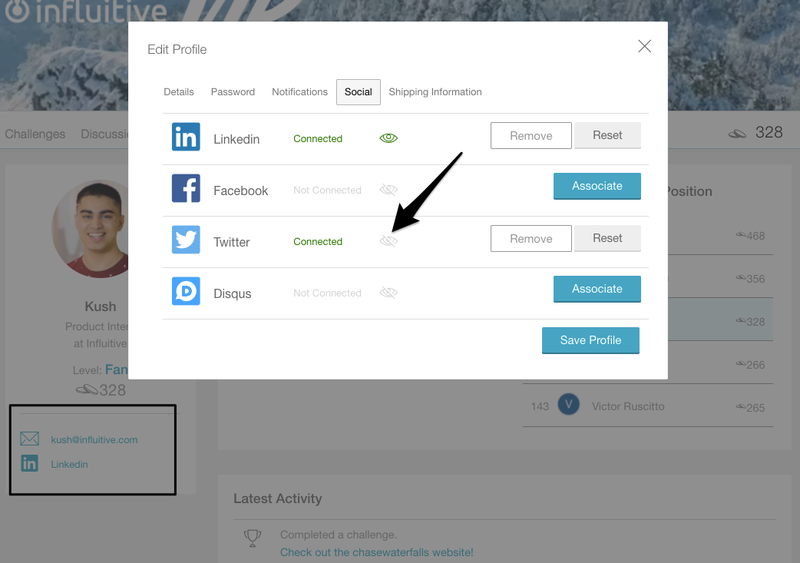 Anywhere in the Hub, clicking on another advocate's profile picture will bring up their profile card and provide options to view their profile page or send them a direct message. 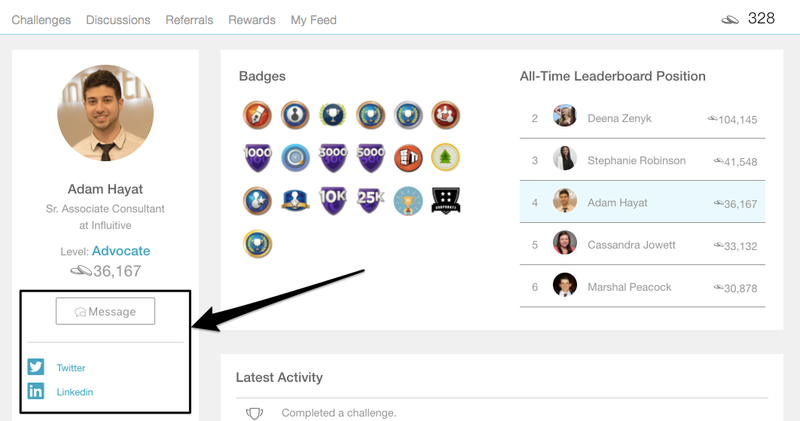 This feature allows advocates to easily discover each other through Hub discussions, challenge activities and the leaderboard. Of course, advocates have the ability to control their profile's privacy settings. They can associate their email and social media accounts, however, this contact information is hidden by default. Other advocates can only view these details if the advocate turns the visibility of these profiles on by clicking the 'eye' icon. Public Profiles are a great way for your advocates to discover and connect with each other. Advocates will be further engaged when they can use your Hub to build on their professional network and connect over your product. To govern the new public profiles and our recent advocate to advocate messaging release, we have created a new Advocate Community control. Turning this toggle off means that advocates would be unable to view each other's profiles or send direct messages, despite being able to see their peer's names within discussions and challenge responses. Disabling community is not recommended because it inhibits advocate engagement within your program. As well, your program will be unable to leverage any community-related feature releases in the future. If you'd still like to disable advocate interaction in your Hub, please contact your coach or support. More on the community toggle can be found on the public profile help article. The Hub messaging interface was updated to visually categorize conversations and allow for user actions on profile pictures. 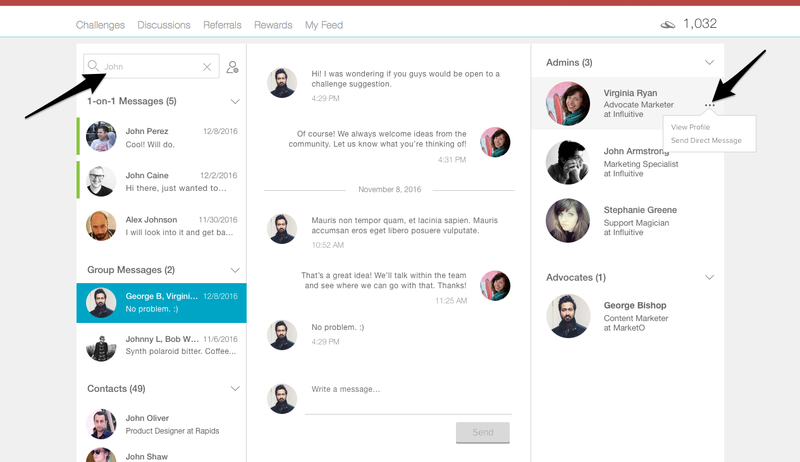 This update gives administrators and advocates more control of the messaging feature. While searching, the left sidebar now separates between 1-on-1 chats and group messages with multiple admins. A complete list of contacts matching the search criteria is displayed at the bottom. Users can also view the profile of the individual they are messaging from the right sidebar. In a group conversation, the option of sending a direct message is now available.